Winter is coming. Or better yet—it’s already here! That cold weather, with its ice and thick snow, holds huge implications for your concrete driveway. So, it’s a good idea to take stock of just what can happen in these wintry months and ensure you’re not doing anything to potentially harm it even more! 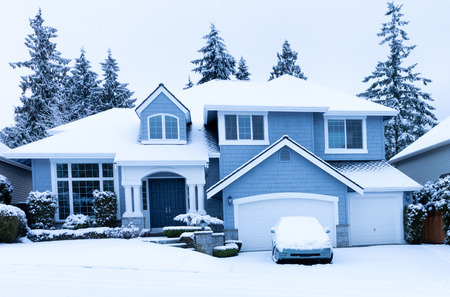 One of the biggest dangers that ice and snow pose to your concrete driveway is the act of freezing and thawing. Water gets into the gaps of your concrete driveway, freezes, and then shifts the concrete, leading cracks to form. This is a huge problem that can cause permanent damage to your driveway. We all depend on plows in the winter, but what do they mean for our concrete driveways? Well, plows can inadvertently take off the protective seal that often is put on concrete during construction, which exposes the material to further damage from ice and snow. It doesn’t cause a ton of harm, but it’s worth keeping an eye on. It’s also worth it to find a reliable snow plowing team that understands how to properly keep your driveway clear without ruining your concrete! We all want the snow to melt—and often times, we go to great lengths to do so, with ice, plows, and other tools that allow the snow to get hit by the sun’s warmth. If snow melts on concrete, there is potential for flooding, which is why it’s so important that your concrete has sufficient drainage underneath. Knowing these issues ahead of time, you’ll be able to prepare properly for what lies ahead this winter and protect your concrete driveway from permanent damage. At Templin Concrete Construction, we understand concrete. Give us a call at 612-388-1945 to learn how we can help you repair or replace your concrete driveway when winter weather causes a ruckus!